Pathological aggregation of endogenous proteins is a common feature of many neurodegenerative diseases. This is generally accompanied by elevated levels of oxidative stress associated with transition metal dyshomeostasis. As such, strategies targeted toward rectifying metal imbalance are increasingly becoming an attractive therapeutic option. One class of compound showing such therapeutic potential are the bis(thiosemicarbazone) metal complexes. These are small, orally bioavailable compounds capable of crossing the blood brain barrier and capable of delivering bioavailable metal intracellularly. Members of this family of compounds have been shown to successfully treat animal models of several neurodegenerative diseases such as Alzheimer’s disease, Parkinson’s disease and amyotrophic lateral sclerosis. 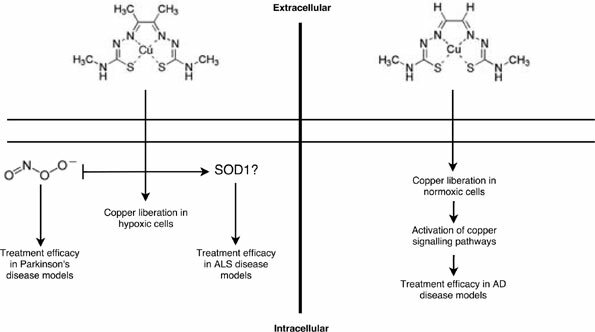 Here we review the current evidence for the efficacy of bis(thiosemicarbazone) metal complexes in treating these diseases and discuss the implications for future development of these compounds. bis(thiosemicarbazone), BTSC, ALS, CuII(atsm), CUII(gtsm), AD. Department of Pharmacology and Therapeutics, University of Melbourne, Melbourne, Australia.